"My favorite of all time," says Nicki of the "Regret in Your Tears" music video, which premieres tomorrow on Tidal. Nicki Minaj told her followers to subscribe to Tidal last night. Now we know why. Tonight, she let it slip that Tidal will host the "Regret in Your Tears" music video, which will premiere tomorrow (April 30). Nicki confirmed the premiere after her fans quickly got her trending on social media, per her request. As expected, the "Regret in Your Tears" video will be exclusive to Tidal. She shared a short trailer for the video earlier this month. She went on to engage with fans about the Mert and Marcus-directed visual -- referring to it as her favorite video of all time. When she first announced the video, she said "Regret in Your Tears" was her favorite song of all time. Nicki also revealed that tomorrow's "Regret in Your Tears" video will "unlock yet another secret." "Regret in Your Tears" is a heartfelt breakup song that many listeners have unavoidably connected to Meek Mill. The track was one of three singles that Nicki dropped on March 10, along with "Changed It" and "No Frauds," as part of what she called a "3 Pack from Paris." 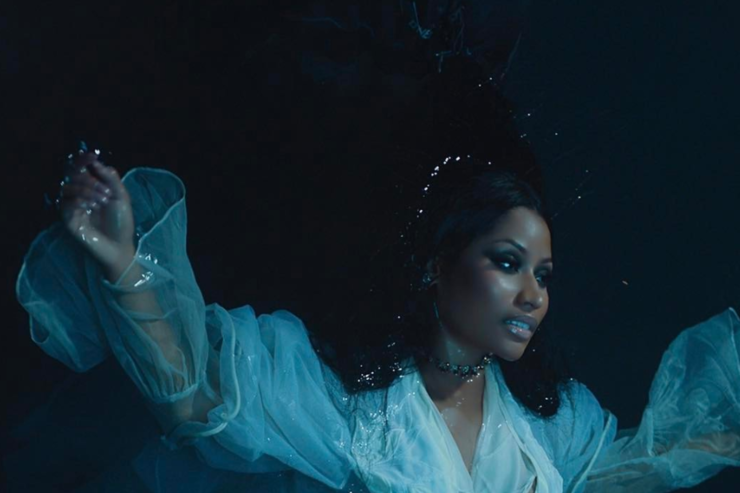 Nicki released the Benny Boom-directed "No Frauds" music video, starring both Drake and Lil Wayne, earlier this month. Watch it below.